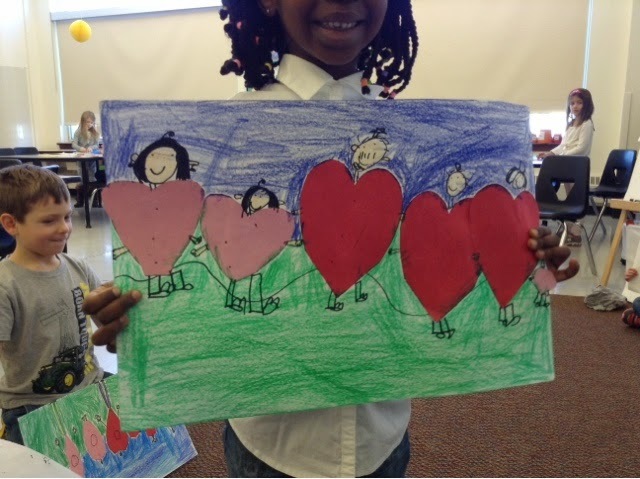 Mini Matisse: February is the Month of HEARTS!! February is the Month of HEARTS!! February is the month of love, and sweet treats, and of course HEARTS!! For our youngest Artists drawing and cutting hearts is not an easy task and it needs to be broken down for our little guys. I like to start in January with these skills. Here is the video that I typically play for the kiddos. 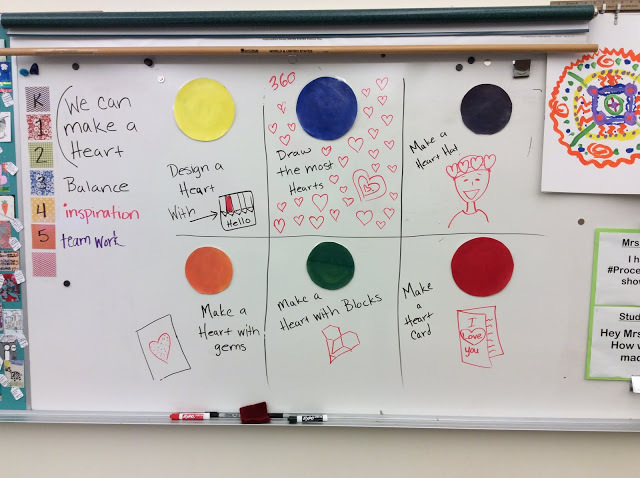 I teach the drawing of a heart to reinforce the type of writing lessons we use in our district. They talk about rainbow curves, it's a bit of letter identification as well. I always say, 'You might know another way to do hearts and that's OK too!". I have found that if we use something they are learning like how to make letters to draw, it seems to stick in those brains just a little tighter. Typically, I would show how to draw a heart first. I then use whiteboards to draw hearts right there after instruction while on the carpet. I might give a challenge like, "See how many hearts you can draw?" or "Can you draw hearts inside of hearts?" maybe, "Can you make your heart into something else?" or even, "Can you make a pattern using hearts and some of our other shapes?" 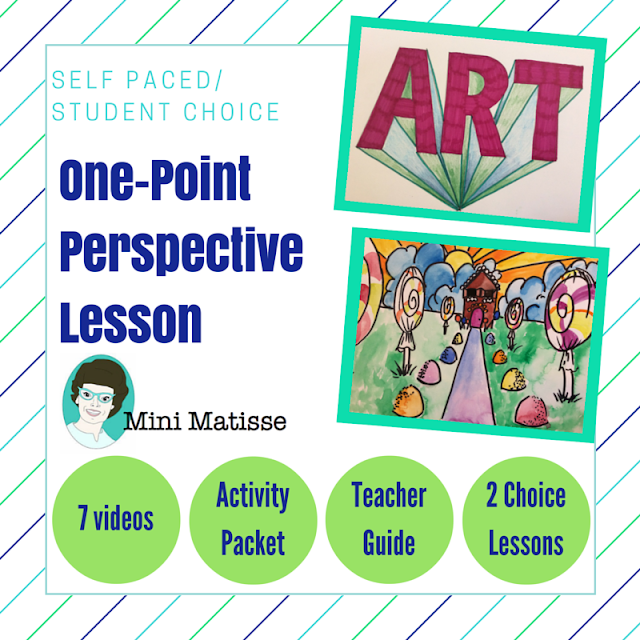 By doing the little challenges, you are allowing your beginning Artist to practice this new skill, yet allowing your more advanced Artist the prompts to advance their skills. In whole, the heart drawing lesson is about 20 minutes long. Then I play the heart cutting portion of the video. I always pause the video where I ask what I did wrong with the cutting. We have a rich discussion and almost everytime someone thinks I ripped the heart apart because I opened it up too fast. See... This is why we need to take a moment to let these new humans to this world infer... guess... investigate. Cutting a heart is not just that... It can be a wonderful lesson of discovery. I not only show the video but then I have them tell me how to cut a heart after the video. They walk me through it and I play forgetful and try to make mistakes so they can all say, "NOOOOOOOO, that's not how you do it?" I do have a lot of fun teaching new skills to the little's. For this portion, they have already put away their whiteboards for a movement break before the video about cutting the hearts, and now they have to get three supplies. They need scissors, a pencil, and paper (I use recycled copy paper so they have an endless supply). For the first heart, I walk them through it; fold your paper... start on the fold... draw the curved line... now the diagonal back to the fold... OK, now let's see what we get, go ahead and cut. Most students will be successful, one or two will not. 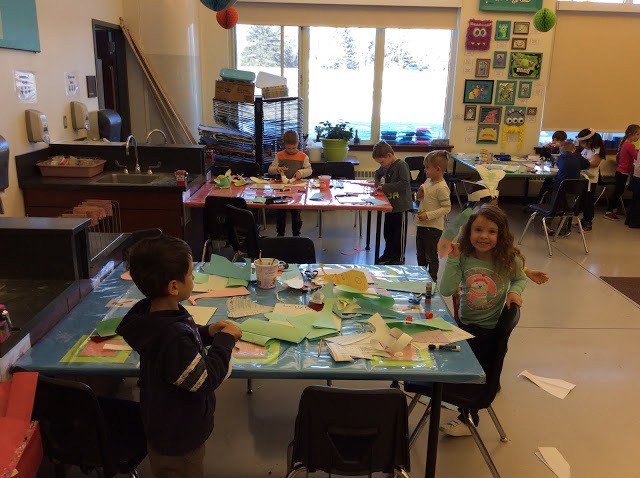 You tell the students they can use all the paper they want (but only one paper at a time, this allows students to move throughout the class and keep their bodies active) For those kids that didn't get it, tell them to give it another try. Once you have identified the few that need that extra help, gather them by you and walk them through it. They need to have one good heart to feel successful. I start suggesting challenges again as well, "How many hearts can you cut out of one paper? ", "Who can make the biggest/smallest heart", "Can you cut a heart inside of a heart?"... Working on challenging those more advanced students keeps them interested. I will say clean up needs about 3 more minutes than usual on a cutting day like this. I tell the kids they can pocket all the hearts they have made and EVERY scrap left needs to make it into the trash. This finishes up my hour of teaching about hearts. Now you have laid the basis for so many lessons and you've given a skill to the kids to work on. This might allow them to share a heARTfelt message to a loved one for the month of February. I have two ways that I have done this in the past. First is when I created stations for K-2nd grade so I would have some upper-level challenges and some beginning options. I worked this by createing 6 stations and allowing choice at each station. (see previous post) The other is geared towards the littles. After I had the group lesson of how they can create hearts, the next week they got to choose stations to go to for more discovery (see previous post). 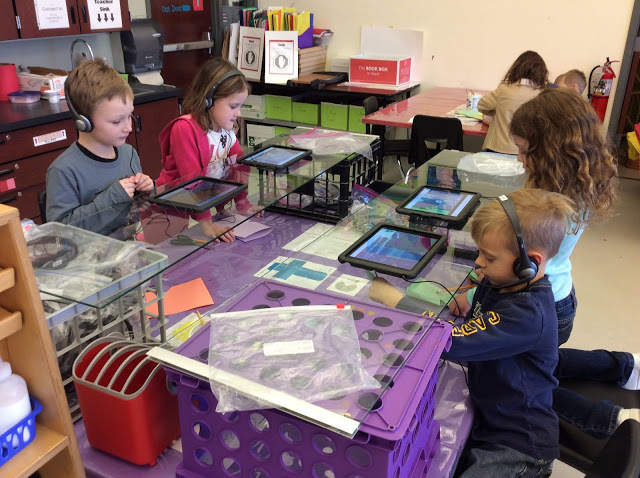 Once I have taught students a simple skill, I like to have them share it with their parents on an app we use in our district called Seesaw. Check out this post to learn more and see examples. 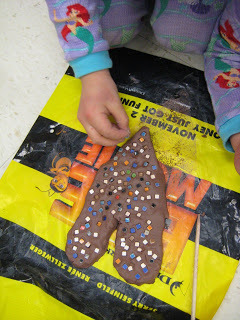 If you are up for a clay day, A great 'Day Two' lesson for the skill of making hearts is this clay... or maybe adapting this lesson for paper. Either way, it's awesome! 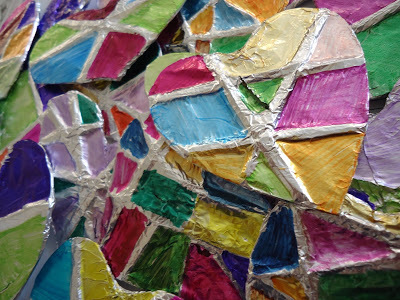 Click here for the mosaic clay hearts. 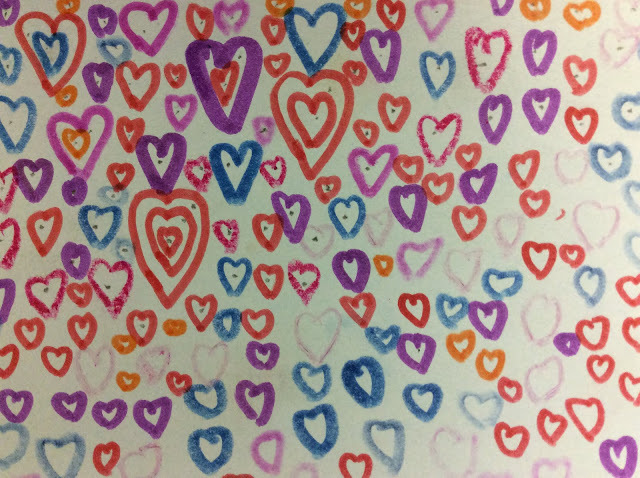 These hearts were done by my students a long time ago for a very good reason. I have the steps of how to create them on this previous post. This idea was offered as a station idea above, but I think it's a great party lesson. 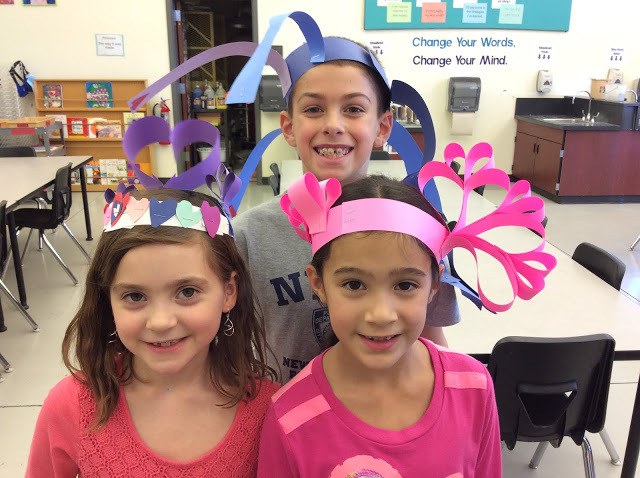 Once kids know how to make hearts, let them take it to another level by adding in glue, staples, or tape to create heart sculptures (or hats). Update: So I go to post this and share it on FB to our Art Teaching Tribe and I see Cassie Stephens has also done an amazing post on the same thing... Be sure to check out her AMAZING posts about heart-related projects that tie into Art History!